Counting on him to play any kind of significant role seems like a mistake. His production has been in decline for years and he was basically a bust for the Texans. Then add in an achilles injury, a tough one to come back from when you're in your 30s. And the injury occurred late in the year, so he'll definitely miss OTAs and possibly much of training camp. I don't necessarily want either coming off an achilles injury but if I had to choose I would much prefer Emmanuel Sanders in this offense. Yup. I'd kick the tires on him. He would have eviscerated people in the Pats offense but we'll have to see what he has left. Turns 32 in March. I would love to see Adam Humphries in New England. Humphries had 76 catches for 816 yards and five touchdowns for the Tampa Bay Buccaneers last season. Solid production for a 26-year-old who has missed only one game in three years. But Humphries should have suitors, and if the Patriots sign him, they may also need to give Edelman a raise from $3 million to keep order in the locker room. The video is NOT GREAT. He’s going to get drafted because his other tape is elite. He was probably going to be a day 2 pick because of the optics but maybe now he’s the first guy take in round 4. I know these guys aren’t angels but I hope we don’t draft him. I know he has an explanation and even married the person after but I’m usually a pass on assault/violence types of character issues. 6 SBs later, and I am arguably more excited about the roster-build and draft of the Patriots in February, than I am about Spring Training, the Celtics and Bruins playoff push, and pretty much anything else in my life. I love this franchise. Have a buddy at work who is a lifelong Jets fan and I have to stop myself from gushing too much at times. Especially when I start talking matter-of-factly about how much better everything in the off-season feels coming off a SB win vs. a SB loss or earlier playoff exit. There's nothing better than a post SB win offseason where your team is loaded with picks and will have a great opportunity to be even better than they were the previous year. I'll enjoy this one all the way to September. You think so, SMU? All the draft evaporators I respect the most saw him as a top 10 selection even with the assault background. From what I understand, the Miss St coaching staff fully vouched for him and that he genuinely grew after the incident. The Patriots, with all those extra picks, seem like a very logical landing spot (I'm guessing late 2, early 3?). He checks so many boxes for them - SEC, scheme diverse, strong hands/anchor, with excellent rush skills. He's the sort of talent that's usually long gone by the time the Patriots pick, so I imagine BB will be very intrigued - even with a red shirt year. Most GMs don't have that kind of job security to take a red shirt player on Day 2. Have a buddy at work who is a lifelong Jets fan and I have to stop myself from gushing too much at times. Especially when I start talking matter-of-factory about how much better everything in the off-season feels coming off a SB win vs. a SB loss or earlier playoff exit. matter-of-factory is a great term to describe the Patriots off-season. Pats sign Schwenke. OL and special teams - former 4th round pick from the Titans. Played three games for us this year before an injury. It's really a 365 days thing. The last time I felt this way was for the Bruins in the 80's (the Pederson/Middleton then Remelin/Neely years) and of course the 2004 through 2007 Sox run. Grateful everyday for this franchise, starting with the Krafts. Had a class in high school in 2004 where we used computers, business class I think. I still remember me and the guy next to me spending basically all of our days devouring every new mock draft in the wake of SB38 trying to figure out who they'd get with the Kyle Boller pick and being shocked that Vince fell so far. Don't think he was even on our radar at the time. Yeah I was also pretty fired up about Andy Katzenmoyer in 1999, but who wasn't?! Very true, but they have a lot of holes. They basically have one WR on the roster and rumored possible retirements could cause big holes at S and TE. They could use some help on DL as well as some supper at LB. Based on the discussion in the "Why Are The Patriots So Good" thread I had a thought. I think players playing under a rookie contract are underpaid. I think Belichick recognizes this and hoards draft picks not just as a way to acquire talent but as a way to manage the salary. Last year they traded a third round pick to the 49ers for Trent Brown and a fifth round pick. 2018 was the fourth year of the contract he had signed with the 49ers. I believe he was signed by Trent Baalke. John Lynch became GM in 2017. If he signs elsewhere as a free agent, it is likely that the Patriots will be awarded a third round pick as a comp pick. Last year they traded a third round pick to the Browns for Danny Shelton and a fifth round pick. 2018 was the fourth year of the contract he signed with the Browns. I believe he was drafted under Ray Famer. Jon Dorsey became GM in 2017. I don't know how much he will get as a free agent or what sort of comp pick the Patriots would receive if he signs elsewhere. So, thinking about similar opportunities for this offseason. Players from the 2016 draft (going into the fourth year on their rookie contract) where the team has undergone recent changes to the General Manager position. Anyone jump out? By my reckoning, you've got 12 teams that have made GM changes in that time span: JAX (Jalen Ramsey, Myles Jack, Yannick Ngakoue), SF (DeForest Buckner, Joshua Garnett), BUF (Shaq Lawson), IND (Ryan Kelly, Joe Haeg), OAK (Karl Joseph), CAR (Vernon Butler, James Bradberry), CLE (Emmanuel Ogbah, Joe Schobert, Shon Coleman, Derrick Kindred, Seth Devalve), HOU (Will Fuller, Nick Martin), NYG (Sterling Shepherd), GB (Kenny Clark, Blake Martinez, Dean Lowry), BAL (Ronnie Stanley, Tavon Young, Matt Judon), and MIA (Laremy Tunsil, Xavien Howard, Kenyan Drake). I haven't checked throroughly to see if some of these guys have been extended already. Out of those names ones that interest me are certainly Ramsey/Jack/Ngakoue but beyond those I'd say Will Fuller, Sterling Shepard, Xavien Howard, and Kenyan Drake. Thank you. Do we know if any of these teams significantly changed their approach (for example, going from a 4-3 defense to a 3-4 defense as a result of a coaching change)? So, if Trent Brown signs a huge contract elsewhere (as many believe he will) Patriots could be looking at a decent draft pick in the 3rd-4th round range, no? In 2020. Assuming the Pats don’t sign any big FAs of their own. 19mm per year is "very team friendly" now? Interesting. Hard pass. Vastly perfer what it would take to get a lesser WR, with less assets and less of a commitment to a guy who has played a total of 16 games the last two years and frequently shows himself as an individual over a teammate. Besides, NFL players (particularly OBJ) frequently comment on other players Instagram. Lazar is suggesting the Pats converting much of OBJs deal into a signing bonus for cap purposes. What could possibly go wrong with giving him most of the money up front? Get real. The Patriots literally don't have enough cap space right now ($15.8 MM) to absorb Beckham's hit ($17 MM). They have some ways to clear space, but they have other needs, too. So if the Pats wanted to make this happen (a dubious assumption), it would be necessary to convert some of Beckham's salary to bonus and spread out the hit. I think those come into effect next year. The Pats will get a few from losing Solder, Butler, Amendola, Lewis, etc..
OTC is projecting two thirds, a fifth, and a seventh. Interestingly the two Super Bowl teams are positioned for the best compensatory haul (relatedly: comp picks are dumb). To me, the biggest question mark is Josh Gordon. If he can play a bunch of games next year they probably don't need to spend a lot of resources acquiring receivers. They could probably just get away with trying to get an upgrade for Hogan, but even then if Berrios takes over the slot, they could move Edelman over to the Z role and keep things more or less the same. In this case, re-signing Brown is the biggest move they'd need to make. If Gordon can't go next year they will have to make some serious moves for Z and X receivers, because Hogan and Dorsett don't seem like they'll be able to get it done consistently. That would probably preclude them from re-signing Brown as well. Gordon I believe is a UFA. They could sign him of course if he manages to get reinstated. Gordon was great but he's an addict. They just cannot count on him for a whole season, even if he's able to get in the field initially. Chris Simms said the Giants were shopping OBJ last offseason and the team most aggressive in trying to deal for him was the Patriots. Now, that may be before he got his extension and he was on his last year. But maybe the talks begin again? You ever get the feeling sometimes that a certain player will inevitably end up on your team in the future, for some reason? That's me with OBJ. From a cap perspective, a post 6/1 trade nets the Giants $17 million in '19 cap space. $4 million in dead '19 space and $12 million in '20 dead space. Sure does. I mean what part of Michel/White/Burkhead, Edelman/OBJ, Gronk doesn't make any Pats fan excited? Anyone that would rather spend the money Odell would cost on Trey Flowers I suppose. I'm one of them for sure. They could sign both players if they realy want to. Likely wouldn't even take that much cap engineering either. It doesn't look 100% right to me. Picturing the moments during and after a unique Patriots' offensive gameplan that includes not throwing to him and he acts detrimental to the team for the world to see and for the hot take business to seize upon. And before anyone pulls the Moss and Dillon cards out and lazily throws them on the table as comps, they were both in late career stages at 30 years old where they just wanted to win and have a chance on a marquee playoff team. ODB just turned 26 and is at the top of his game and top 3 in the league. What about this player, salary and career stage says Patriots, beyond his talent? Throw in how tight the Patriots cap is with signings that still need to happen along with giving up valuable trade capital and this seems really far-fetched. My .$02. Yeah, it would. Quite a lot actually. I think the only Michael Felgerism I've ever agreed with is that the salary cap is (mostly) a myth. 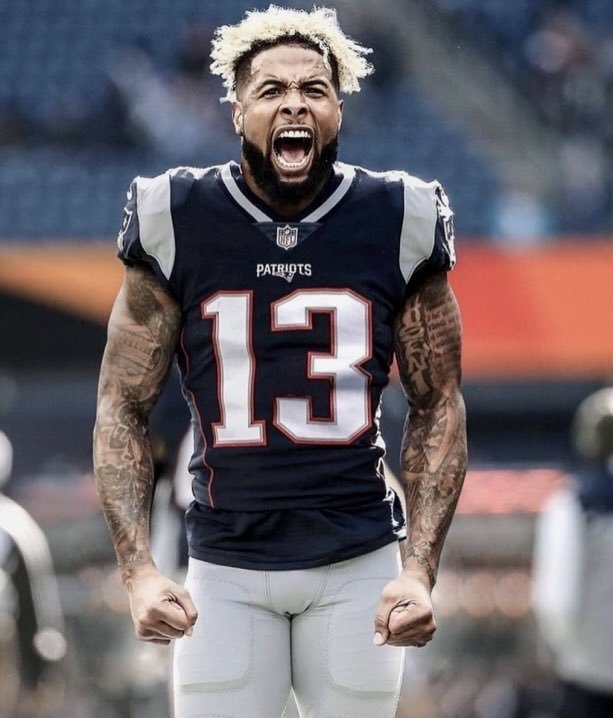 If the opportunity was out there for the Pats to actually get OBJ, and they placed value on getting him and signing Flowers, I'm sure they could do so quite easily. Cutting or restructuring Cannon Allen Claymore is about as easy as it gets. The only difficulty lies in whether or not Gronk / McCourty and their respective cap hits are coming back or can be restructured if they do. That said it remains unlikely given the holes the team has at various positions. It might be a myth for a given year, or even a 2-3 year period of time, but eventually you have to pay the piper. I wouldn't base anything on what Chris Simms says. The man is blinded by hate. Not sure what his angle is here. Beckham or any diva receiver can work here or anywhere under the right circumstances. In Bill we trust, yada yada. I will pull the Moss and Dillon cards because everything you said about those two players is a hindsight analysis. There absolutely were similar questions about their commitment, personality and locker room fit before they came to New England.